If you are about to get married and your mind just can’t stop bugging you with weird thoughts, then you need to calm yourself down, cause girl, believe me #Itsnormal! Everything looks like a dream, everything is a fairytale. That’s right girl. Its totally normal if you want to scream loudly on the top of your voice. 2. Nine Months before the wedding! Yes, at this moment your confidence level is still intact and no wonder you are enjoying all the attention that you are getting over it. 3. Six months before the wedding! Of course, this is bound to happen and the paranoia metre hits another level if anything gets delayed! So it's ok to go a little crazy with all the wedding planning, because let's face it, it is that one day which will probably change your life forever! 3. Three months before the wedding! This is a period where you experience a mixture of emotions. No Matter what you do, you are sad, happy, excited and terrified at the same time! When you can’t do anything about things going astray, then you have to accept it with some jugaad! c. One thing is for sure, that you just can't stop thinking about your first night and how special it would be, right ladies? Now comes the time for realization. 6. Four days before the wedding! And here it comes! All the thoughts pouring right through! An extravaganza of mixed emotions! b. Weird thoughts are definitely gonna come pouring in your mind! And no matter how weird they sound, they are all genuine concerns! 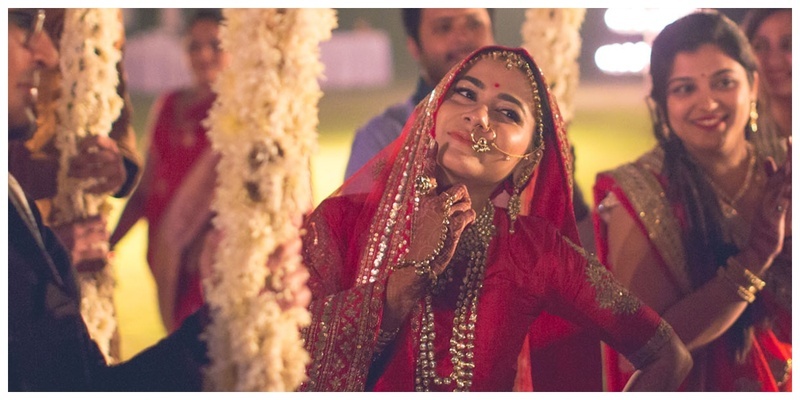 ‘How will i carry the weight of such a heavy lehenga and jewellery? What if I fell down while walking down the aisle? How will I pee in it? It's so huge! My god these heels! Can I wear my sneakers please? I know its too much, but you gotta chill, cause its totally and absolutely normal! Excitement, thrill, nervousness and ofcourse PANIC ATTACK! a. ‘I hope I don’t look like a witch in a heavy make-up! Please God, make me look gorgeous! c. ‘Do I have a weird smile? How should I pose? 8. Right before the D-day! Ladies, its absolutely normal to have a huge bundle of questions and emotions when you are getting married! Its new, its exciting, its terrifying but its beautiful! So put all your tensions aside and enjoy the feeling cause its simply amazing!